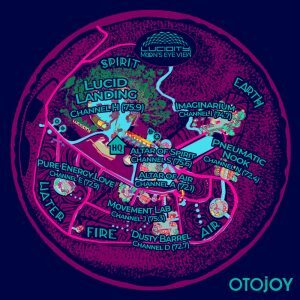 Lucidity Festival 2019: Moon’s Eye View takes place April 12 – 14, 2019. Our course week offerings will take place on the event grounds April 10 – 12, 2019 (Arrival date is April 9, classes begin April 10, and graduation is April 12). Lucidity Festival is a 24 hour event, beginning on Friday morning and ending on Monday morning. Site-wide, amplified music ends daily at 12AM. After this time only acoustic music may be played. There are lots of fun activities in the theme camps throughout the night, like silent discos, acoustic sessions, cuddle puddles, and interactive art displays. Gates open at 9am on Friday morning for 3-Day Event Pass holders. Anyone arriving before or after the gate times will not be able to drive onto the festival site. Please consider these hours when planning your trip – no one likes setting up in the dark! The Box Office and Ticketing Arena is your first stop on the way into Lucidity. All traffic passes through it, and it is a carefully planned out process that gets everyone safely into Lucidity. Remember to be as present in your actions as you arrive as you will be inside the festival. As you arrive, prepare by having your ID and electronic ticket(s) on-hand. If you have to check in at the Box Office, have all the information you need to claim your will-call ticket. Your wristband is your ticket. Do not take it off, do not tamper with it, do not lose it. Anyone without a wristband, or in possession of a wristband which has been altered in any way, will be escorted off festival grounds. We have a limited number of Thursday Early Arrival Passes available for purchase. Please do not plan to arrive early unless you have previously acquired your Early Arrival Pass. An Early Arrival pass will only gain you entry to the event WITH a 3-Day Event Pass. Our intention with this program is to provide a comprehensive and fair platform by which people may apply to receive the opportunity to purchase a ticket at a reduced rate. This program is tailored specifically to those who may not otherwise be able to afford a regular priced ticket to the festival. In total, 40 tickets will be available. Each application will be evaluated appropriately as per individual situations. We appreciate you taking the time to fill out your details and attach the documentation needed to give your application the attention it deserves. Absolutely NO open flames – this includes fire pits, charcoal BBQs, and burn barrels. Propane grills and camp stoves are permitted. The only open fire is the venue’s central campfire which will be maintained by staff throughout the event. This common location is open to all, but please self monitor your use if there are people waiting to spend time there as well. Clean drinking water is provided on site at water refill stations. These stations are to re-fill water only and are not for washing dishes, clothes, or bathing in! Please work with us to END SINGLE USE by bringing only large refillable containers for your campsite and a vessel for yourself. Lucidity Artifacts is proud to provide branded items – check out the Artifacts website to find the coolest water containment vessel out there! Elevating the Leave No Trace philosophy, our goal is to “Leave it Better” than when we arrived. Set up general waste collection within your campsite for food, personal cleaning products, party accessories (batteries, makeup), etc, and find ways to limit your trash before you arrive by taking products out of their packaging. Also bring reusable eating utensils, plates, cups, and cloth napkins. We need your help in creating a zero-waste environment. If you pack it in, then plan to pack it out! We constantly aim to find ways to make improvements to the grounds, and take steps toward stewarding the land, trees, and animals in a way that is respectful to our planet. Help us set the example – it takes us all to make it happen! Ice will be available onsite for you to purchase from the Lucid City Hub. We will have trained professional medical care available on site. The medical team will be positioned at the main Medic pavilion, located across from the showers. Should you need immediate medical assistance, alert the nearest staff member ASAP (identified easily as someone carrying a walkie). We are here to keep you safe! All Workshops, Bodywork, and Healing services are included in the price of your entry, and fee-free throughout the event! Take advantage of learning a new modality and/or meet inspiring teachers and fellow students. These workshop facilitators and healers are all volunteering their time and energy in sharing their gifts with you – please respond in kind – gratitude, barter, gift exchange, and even tips in the form of money will all be graciously accepted. Our Dream Rangers and Security are here to assist in creating the most enjoyable experience for each participant. We value our participants as part of our family and intend to create space with safety and comfort as priorities. Please respect and honor these dedicated, compassionate men & woman – they are powerful allies and act as a barrier between participants and outside agencies. We are all here to have a good time! If you need the services of either of these teams while on site, you can go to our centrally located Info HQ at the end of vendor row, next to Branches Gallery, or find any crew member with a radio. They will be able to assist with calling these teams for you. Are all body workers and healers licensed or certified that attend and offer services at Lucidity? No. Many are, but as an open-source festival that encourages participation we also want to allow those with natural abilities to contribute as they feel fit. We ask all practitioners who are unlicensed or uninsured to refrain from heavy pressure and/or any structural work. We encourage participants to develop a relationship and communicate your needs, concerns, and any questions prior to enjoying the healing arts. My application was not accepted, will there still be a way for me to contribute at the festival? Absolutely. We have many participant driven sound camps that will be offering space to play and perform. Explore – if you are meant to share a certain gift, the chance to express and collaborate will make itself available! Where is the closest City/Store? Live Oak Campground sits roughly between Santa Barbara and Santa Ynez – both roughly 20 minutes away. Be mindful of your needs and try to bring in everything you need the first time. We will have showers available on site, and due to our current drought situation, we ask that you be mindful in their use. It takes 25 gallons of water for a 10 minute shower, so be aware… save some to share. We kindly ask that you do not set up camp showers or venture to the river (which is restricted from access anyway). Showers will be open daily for a small fee. NO. Dogs, cats, birds, snakes, fish – do not bring your animal companion. No pets are allowed on site. Any individuals bringing in their pets will be turned around at the gate. If found on-site with your pet, both of you will be asked to leave. Service animals are defined by the U.S. Department of Justice (ADA) as dogs that are individually trained to do work or perform tasks for people with disabilities. Examples of such work or tasks include guiding people who are blind, alerting people who are deaf, pulling a wheelchair, alerting and protecting a person who is having a seizure, reminding a person with mental illness to take prescribed medications, calming a person with Post Traumatic Stress Disorder (PTSD) during an anxiety attack, or performing other duties. Service animals are working animals, not pets. The work or task a dog has been trained to provide must be directly related to the person’s disability. Dogs whose sole function is to provide comfort or emotional support do not qualify as service animals under the ADA. If you have a certified service animal that you are required to have with you at all times, please bring the paperwork to support this, and the identification for your animal. You’ll be required to have your service animal with you and ON LEASH at all times. Please contact us via info@lucidityfestival.com prior to the festival so that we are aware of your needs! Got some little ones you’d love to bring along? Lucidity is proud to host a family friendly environment for kids of all ages – we even have a themed village just for families! Please ensure that each little one has a ticket prior to arriving onsite. 3-Day Passes for kids between ages 13-17 are greatly reduced, and children 12 and under are FREE. Tickets can be found on our Buy Tickets page. Alongside kids and teens tickets, we ask that you fill out the Minor Liability Release Form for each child separately. This helps us keep track of all children on site in case of emergency. Help us keep Lucidity a safe dreaming ground for all! 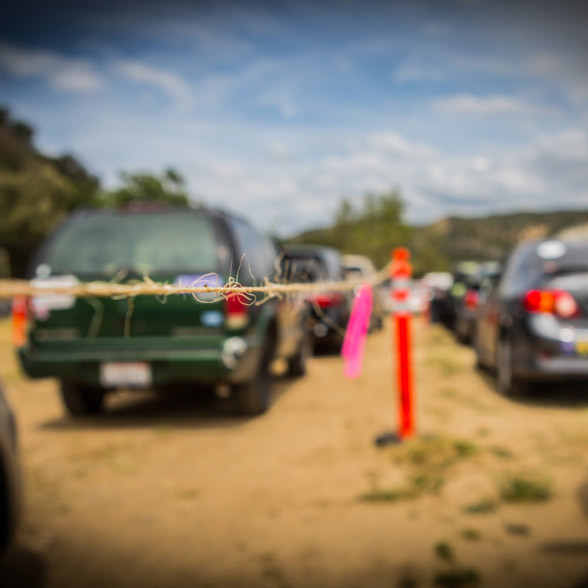 If you’re planning to car camp in the Family area, please purchase your car camping pass and also fill out the Family Garden Car-Camping Registration. The gate to Lucidity opens daily at 9am. If you would like to experience the shortest and smoothest entrance through the ticketing arena, please do not arrive prior to the gates opening. If you have already been on site and have your wristband, please let security at the front gate know when you arrive. When do the gates close? The gates close daily at 9 pm. Once they are shut, no more vehicles are allowed onto the festival site. Please plan your trip accordingly, and if you arrive after the gates close, stay in Santa Barbara overnight and arrive once gates are open the following morning. Vehicles on site are permitted to leave after the gates close, so long as they are parked in the parking lots and NOT in the campgrounds. Vehicles parked with Car or RV Camping stickers are not permitted to move after dark, for the safety of everyone. The event is officially over as of Monday morning. We kindly ask that you pack out by NOON. We appreciate your mindfulness as you pack out all that you brought in! If I am performing, offering a workshop, a food or merchant vendor, or a healer – can I get early access? ONLY if you have previously arranged your arrival with your Lucidity contact. Early admittance is Thursday, April 11th and all those wishing to access the site on that day must be pre-registered or have pre-purchased their Thursday EA Pass. 3-Day Event Pass holders that do not have EA Passes will not be able to come onsite until Friday morning. If I am a Dream Maker (volunteer), can I arrive early? Yes! Dream Makers will be allowed on site beginning Wednesday evening. Our volunteer coordinators will be in touch with all the details! Can I buy tickets in person somewhere? Hardcopy tickets are not available for Lucidity. All tickets can be purchased online through our website. Are there opportunities to win a ticket? Always! We love hosting contests, and so do our friends. Keep an eye on our Facebook page and sign up for our newsletter to be the first to know! Does my ticket include camping? 3-Day & 2-Day Event passes include camping. 1-Day Event Pass DOES NOT include camping. Thursday EA Pass provides for Thursday night camping. Can I get a Refund for any of my ticket purchases? Lucidity does NOT offer refunds for tickets. Please refer to the instructions below on how you can transfer your ticket to another exceptional being! If you have an extenuating circumstance such as an unplanned family emergency, personal debilitating situation, something outside of your control has happening, please email info@lucidityfestival.com right away and we will address your situation individually. How can I transfer my ticket for Lucidity Festival? If you are not able to join us for the event, we have empowered you with the ability to transfer your ticket to another person, as we do not offer refunds for tickets. Enter the email address you used to register for your tickets. If you’ve forgotten your password, no problem! Just enter your email address where it says ‘Forgot Password?’ and you will be sent an email to help set your new password. Once logged into your account, click on ‘View Order’ to view your event. Select the Edit details button to the right of the ticket type you purchased, below the event title. The new holder of your ticket will receive an email allowing them access to the ticket. It is now in their name and they can access it through Eventbrite in the same way that you have. If you have any questions about this process, please get in touch with our ticketing team via info@lucidityfestival.com. All participants are asked to be personally prepared by arriving with your own ticket. All tickets are purchased online through Eventbrite and are accessible for you to view, change your personal information, transfer to another person, and download. If you give your ticket to another person, please do so via the ticket transfer information given above. If you need to visit the Box Office to pick up your ticket, please bring your ID and any other relevant information you may need. Can I pay for my ticket with a payment plan? Yes you can! Affirm is a financing alternative that offers instant financing for online Eventbrite purchases that you can may in fixed monthly installments of 3-6 months. This is a new payment method available this year. Not everyone is able to use affirm. Affirm is only available in the US, you must be over 18, have a valid US home address and phone number, and a social security number. Several elements are considered by affirm when deciding to grant your loan; so simply selecting the payment method does not mean you will be approved. That being said, you can still be accepted to Affirm even without extensive credit history. Please note that Lucidity is not responsible for decisions made by Affirm, and does not manage your payment agreement. Affirm is a third party operating for Eventbrite, and so if you have issues with your payments or anything regarding your payment plan, you must get in touch with Affirm directly through help@affirm.com. All vehicles are required to pay a parking fee. $30 for cars with two or more people, $40 for single drivers. Shuttles from the upper and lower parking lots will bring you and your gear to the campground. Once you arrive at the parking area, you will load your gear onto a large shuttle truck that will bring you to the campground. There are 3 designated shuttle stops around the campground. See “How does the shuttle work?” for more info! Vehicles with Car Camping and RV Camping passes will be directed onto the festival grounds and may have additional guidance to park. Our parking lots are monitored, and we do not allow camping within them. Large Gear&Shuttle trucks will bring you and your gear from the parking lots to the campground and back to the parking lots at the end of the festival. Once you arrive at the parking lot, you may use the TEMPORARY unloading zone to unload your gear for the Shuttle. Go PARK YOUR CAR, and come back to the shuttle stop to hop on a shuttle with your gear. PARK YOUR CAR BEFORE HOPPING ON THE SHUTTLE! Shuttles will run from the upper and lower parking lots to the campgrounds throughout the festival. Shuttles are large stake-bed trucks with a lift gate to make it easy to load up, but please pack your gear in containers or bags to keep your stuff together. We highly recommend wagons to make your life easier! Shuttles will operate during gate hours and a little after. Mon: 7 am to NOON. Campground must be cleared by NOON on MONDAY!! Everyone must ride the shuttle with their gear back to the parking lots. No cars are allowed to drive up to the campground to get your gear. Pack your gear and bring it to one of the 3 shuttle stops. Trucks will bring you and your gear to the Lower and Upper parking lots. You can unload your gear, go get your car, and load up in the TEMPORARY lot. Please note – this is a TEMPORARY unloading/loading area – do not get on the shuttle until AFTER you have parked your car! Bicycles are not encouraged at Lucidity, and are not really necessary. Live Oak Campground is an intimate and relatively small venue. You’ll find everything within comfortable walking distance. If you require ADA assistance in getting around the event grounds please contact info@lucidityfestival.com. What’s the difference between Car Camping and General Parking? Which one do I pick if I want my car parked near our camp? 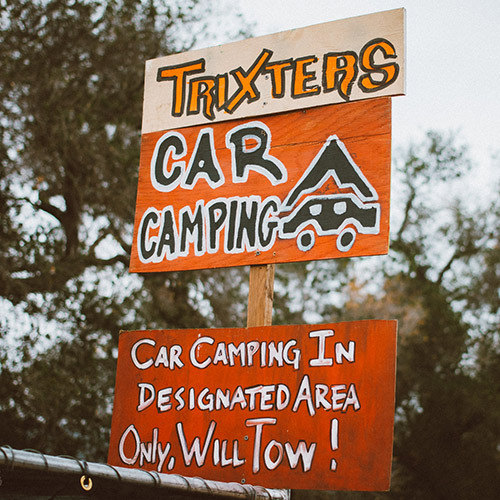 A Car Camping Pass is what you will need in order to park your vehicle inside the event with your camp. These passes (and RV Camping Passes) are limited to allow for everyone to have enough room to camp. Car and RV Camping Passes are currently SOLD OUT. Please be mindful of your footprint – if you don’t use your car to sleep in, consider leaving it at home and carpooling. Most vehicles will park in one of two General Parking lots on the edge of the festival grounds. There is NO CAMPING in the parking lots. All vehicles coming on site are subject to an environmental impact fee. This fee is included in Car and RV Camping Passes. For those without a car camping pass or RV pass, the fee is $30 for cars with two or more people, $40 for single drivers. What’s the difference between an RV Pass and a Car Camping Pass? An RV Pass is for a vehicle longer than 18ft. Trailers of any size are also classified as RVs. For more definition on what classifies as a motorhome or RV, check out this DMV webpage. A Car Camping Pass is for a vehicle less than 18ft in length. If your camper van is less than 18ft, you’re in the clear with a Car Camping Pass. If you show up on the grounds with a vehicle longer than 18ft, or a trailer, and you DO NOT have an RV pass, you will not be allowed to bring your vehicle onto the camping grounds. It will be parked in general parking, you will pay a larger impact fee (to account for your larger vehicle), and you will not be able to sleep in it. There is NO CAMPING in the parking lots. Please, be mindful that our site has limited space and everyone wants a comfy spot to sleep. There will be NO RV OR CAR CAMPING PASSES available at the gate. Bags of ice will be for sale – 10$ for a 20 lb. bag. Can we amplify sound at our camp? Our festival has a delicately curated music schedule site-wide to ensure that our soundscape is peaceful and creating the most positive experience for all participants. If you are wanting to supply music for yourself and campmates please be mindful of your neighbors. If you are wishing to have your sound featured as a public offering you may write into curation@lucidityfestival.com and we will attempt to accommodate placement and preferred hours of sound for your camp. Please include details regarding the size of your camp and types of music. No allocations will be provided for any additional offerings at this time. Please remember that an environment not appearing on our official music schedule may be asked at anytime to shut down their sound. If any environment does not comply with this request, Lucidity holds the right to confiscate equipment or ask campers to leave at any time. Once we are placed in camping, do we have free reign to set up any kind & size of camp we want? The campground provides ample camping space for our attendees, provided you are mindful of your footprint. This is a co-created event, and so you are invited to bring and do what you like as long as you are respectful and compassionate to the needs and experiences of others. Any amplified sound must be approved BEFORE the event. Please be sure to info@lucidityfestival.com if you are interested in bringing such an offering. You may be asked to shut down if you set up a sound camp that is NOT pre-approved. Remember that amplified music is not allowed after midnight – this includes drum circles. We cool to run a generator? Please be conscious of generator placement and the hours of use. If you are unsure, err on the side of being too considerate of your campmates. Consider bringing and decorating a generator cover – plywood walls with an open top. Conceal your cords, or flag them with neon tape. If you do not feel artistic, allow it to be a Live Art collaboration! If your generator is identified as being disruptive you’ll be asked to turn it off. This is out of consideration for the group experience. Can we post up theme camp style? The different areas of Lucidity are based on themes that align with our story arc! And yes, we encourage theme camps but only with an appropriate heads up! Large theme camps & sound camps that are not confirmed in advance will be asked to reduce their impact. Contact us before hand if you would like to discuss which area might best represent your theme camp – email info@lucidityfestival.com. And then apply for placement of your camp HERE. Is there an official sign up for our theme camp or do we just show up to the spot we want to stay in? There is no official sign-up process for theme camps, but if you are interested in hosting an environment for others to enjoy, we encourage you to fill out the theme camp application from our participation page. If you are looking to just hold space for you and your friends, touch base with the camp host when you arrive on site to check in about the size of your footprint and the best location to set up. Anyone looking to bring amplified sound is required submit an environment application, as sound camps are restricted to allow for guests to enjoy the offerings on the main stages! Will there be an RV/Trailer camping area? Yes. You must have pre-purchased an RV pass to bring your RV or trailer to Lucidity. We offer a very limited number of these in an effort to maintain enough camping space for all attendees. If you do not purchase an RV pass and show up with an RV or a trailer, you will have to park in General Parking and be subject to a higher impact fee (to reflect your larger vehicle). There is no camping allowed in the general parking lot. Trailers that have been pre-approved for RV passes will not be permitted to have their vehicles alongside them. An RV or Car Camping pass is associated with one vehicle only. You can drive your trailer in and park it, and leave your vehicle in the General Parking Lot. You will be allowed to drive back in at the end of the event to hook up your trailer. Is this festival a camp out/ bring your own tent function? Indeed it is! Please bring your own tent, dome, yurt, or free-design structure to camp in. That said, space is limited at Live Oak Campground so we ask you to be conscious of your footprint. Let there be enough space for all to enjoy! Will there be a central trash/recycling or do we take out waste with us? This is a Pack it in / Pack it out event. Our motto is to leave it better than we found it. If you bring garbage or packaging we ask that you plan to pack it out when you leave. Help by bringing reusable eating utensils, plates, cups, and cloth napkins, and by removing products from packaging and cardboard boxes before coming. Water is provided on site so no need for single use plastic water bottles – in fact, we discourage the use of plastic water containers as they are not only toxic to your body, but destructive to the Earth. What is the personal cooking situation? Can we set up a kitchen? Propane BBQs and camping stoves are permitted, but there are absolutely NO OPEN FLAMES or charcoal burners. Conscious food venders, regulated by SolFood (Sustainable, Organic, and Local) will be providing food during days and evenings. We encourage the use of food provided through the festival as we are being conscious to make it both affordable and healthy – and it creates less waste and trash than bringing in your own. In any case, bring your own re-usable dishes and utensils. Help us co-create consciously! If you are setting up a kitchen onsite, be mindful of your grey/black water creation. There are no dumping facilities onsite, and, being in a pristine, natural setting, we would like to “leave it better”. Bring an extra 5 gallon jug to collect your dirty water, and bring it offsite to dump appropriately. Think Burning Man style… be mindful of our grounds! Photography without consent. All media members should should go through the application process to be approved to photograph the event. These are items that we suggest you bring for your comfort, entertainment, and safety. Bring three (3) trash bags to keep your recyclables and compost separate from landfill waste. Leave no trace – leave our site and the park better than you found it. Pack it in, pack it out! Reusable water bottle. Stainless steel is best. They will be available for purchase at Lucidity Artifacts onsite if you forget yours! Reusable eating ware and utensils. Even the food court will allow use of your own washable plate! Costumes (we know you won’t forget), decorative lighting, lots of blinkies and other things to decorate and light yourself. Did we mention no glowsticks?! Camping gear – ideally waterproof. Tents and tarps need to be free-standing. Set a tarp down as a ground cloth below your tent, and pack a few extra large garbage bags to protect your gear just in case it rains. Shade structures, umbrellas, parasols, sheets, canopy, tarps, tent, parachute; something to break the strong mid-day sun and/ or rain. However – please be mindful of your individual footprint to allow enough space for all. Appropriate clothing: light clothes for during the day (likely high 60s-70s), warmer clothing for at night (likely high 40s-50s) and rain gear. Any prescription medications, contact lens supplies, and whatever else you need to maintain your health and comfort in a remote area with no services. Be conscious of your contact with the sun. We do not endorse the use of sunblock – the sun is good for you; grow your relationship with respect needed to avoid sunburns. First aid kit – we have a medical team onsite, but it is always a good idea to have some essentials just in case. Lucidity is accessible to all guests with disabilities. We continually seek to improve accessibility and we ask that you contact us at info@lucidityfestival.com with specific needs, comments, questions and/or suggestions. Can I find ADA/ASL info at the festival? Yes. Please go to our Info HQ booth, centrally located near vendor row and the Mindful Feeding commissary – see the festival map for details. Scroll down for more details on our ASL/ALD support services! Will there be ADA designated camping on site? Yes. This area has been designated close to the action, with nearby access to power, security, and medical, and it will be marked on the festival map. 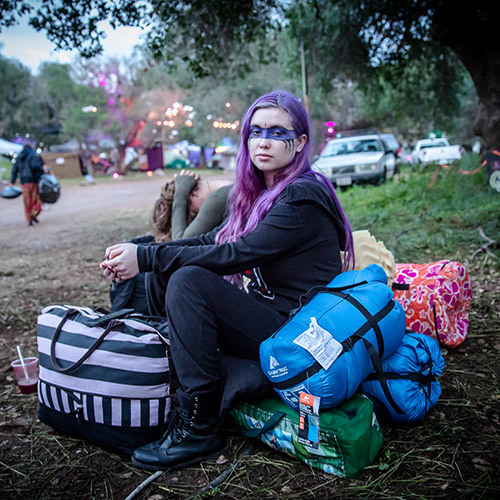 If you are planning on attending Lucidity and have concerns about your camping or parking in regards to ADA needs, please email info@lucidityfestival.com and we’ll work with you to be comfortable. If you are requiring services beyond what a regular campground can offer, please be sure to communicate your needs well in advance of the event as it might not be possible to accommodate all needs once the event has started. Is the terrain at Lucidity acceptable for wheelchairs? Yes, the majority of the terrain is navigable by wheelchair. Is there shuttle service for me and my gear? Please check-in at the Box Office when you arrive and you will be helped to transport your gear to your campsite. Also, there are ADA Car Camping Passes available for a discounted price, which you can pre-purchase by emailing info@lucidityfestival.com. If you haven’t pre-purchased your pass and need one to be most comfortable at the event, simply check in with the Box Office when you arrive. Is there wheelchair user and companion seating (at stages, etc.)? Yes, each stage offers space on the side of the stage and very close up. If desired, go to the backstage entrance and speak with event staff or volunteer for assistance. Workshop areas will also be accommodating. Are service animals allowed into Lucidity? Service Animal Policy – Service Dogs YES, Pets NO. Under the Americans with Disabilities Act, the definition of “service animal” is limited to a dog that is individually trained to do work or perform tasks for an individual with a disability who is in attendance. The task(s) performed by the dog must be directly related to the person’s disability. Under the ADA, “comfort,” “therapy,” or “emotional support animals” do not meet the definition of a service animal. – U.S. Dept. of Justice. Those bringing service animals should check in in your service animal at the box office when you arrive to get them a wristband and associate your animal to you. This way, in case you get separated, we can reunite you without delay. Be prepared to present the appropriate credentials to have the animal onsite. Service animals must remain by the handler’s side at all times and must be harnessed, leashed, or tethered, unless these devices interfere with the service animal’s work or the individual’s disability prevents using these devices. In that case, the individual must maintain control of the animal through voice, signal, or other effective controls. Ejection Policy: Those who masquerade their pet as a service animal will be ejected from the site without refund. A service animal found without with their owner is also grounds for ejection from the festival without a refund. We appreciate your cooperation as we host a safe event for all! Are the bathrooms ADA accessible? Yes, there are accessible bathrooms. They are marked on the map. Will there be ADA showers? Yes. Showers are wheelchair accessible. Please refer to the festival map for details (will be posted in the future). Where can I go for first aid/medical assistance at the festival? The Medical Tent and First Aid locations are centrally located, with minimal hills or distance to travel from the PWD camping area. These services will be clearly marked on the map given to all attendees. In case of emergency contact the nearest event staff member, identified usually as a person wearing a walkie. Are the food, vending, and other concession stands wheelchair accessible? Yes. But should you require assistance at any of these areas, please contact the nearest event staff or volunteer. Who do I contact to discuss specific needs? Please email info@lucidityfestival.com and someone will be in touch with you shortly. Are there ASL services available? Yes – we are proud to offer ASL services by request. Please contact us via info@lucidityfestival.com to let us know of your needs. Onsite, you may request these services through the info booth at your convenience. Lucidity will be also be providing RF (Radio Frequency, FM) assistive listening systems for patrons with hearing loss and other sensory disabilities at all music stages (Lucid Landing, Pneumatic Nook, PureEnergy.Love, The Dusty Barrel, Imaginarium), at the Movement Lab, and at two of the lecture areas (Altar or Spirit, Altar of Air). Assistive listening receivers with headphones and neck loops will be available at the Info Hub (HQ, close to Magical Marketplace and Lucid Landing Stage). 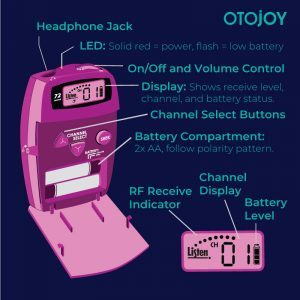 You will also receive information on what stage transmits on what channel and replacement batteries. Whenever the rechargeable batteries of the device are empty, you can swap them out at the Info Hub (HQ). You will be required to sign a consent form and leave a government-issued photo ID as a deposit to borrow a receiver. If you have a hearing aid or cochlear implant, you will receive the best sound quality via your t-coil (or telecoil), which all cochlear implants and 80% of all hearing aids have. However, many users aren’t even aware of this feature. If you don’t know how to access your t-coil or are unsure whether you have one, please contact your hearing healthcare provider and have your device programmed accordingly prior to the event. A remote control for your hearing device is also very valuable, since it can be difficult to hear beeps for program changes or volume adjustments in a noisy environment. Assistive listening devices can be reserved beforehand by emailing info@lucidityfestival.com. Remaining devices will be available on a first-come first-served basis. The turn off for Live Oak Campground (Lucidity Venue) will be on your left after 21mi. Merge onto Calle Real by going straight through the light.